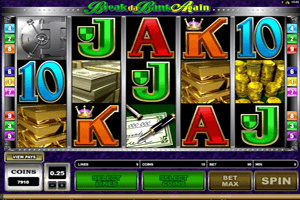 Break da Bank Again is the amazing sequel to one of Microgaming’s most iconic games, Break Da Bank, which was a 3-reeled slot machine. This time, the bank heist is bigger, better and more rewarding as players will enjoy a one of a kind experience as they try to break into the bank’s safe once again order to claim as much money as they can before the police shows up. The game is presented to players in amazing and colorful visuals that provide them with a satisfying visual experience. Play Break da Bank Again Slot here. The icons include stacks of dollars, golden coins, the bank’s safe, diamonds, jewels, golden bars and the logo of the game. The game comes with its own amazing set of special and rewarding features. This includes the logo of the game which acts as a wild icon that can replace any of the rest of the symbols to help players get paid, with the exception of other special and bonus symbols. There is also the scatter safe door bonus symbol. This symbol has the ability to trigger the free spins round that comes with a multiplier of 5x. The number of free spins totally depends on the number of scatters appearing on the reels of the game. 5 symbols will trigger 25 spins, 4 symbols will trigger 20 spins and 3 symbols will trigger 15 free spins on the video slot machine.